Intensive Wrinkle Free Anti aging Eye cream is a power house light cream packed with botanicals and anti-wrinkle ingredients that have multiple preventative functions which includes firming, building essential collagen and increasing moisture nourishment. The formula for this eye cream exemplifies, ‘luxury’, and therefore, it is formulated with the ingredients we would want to see in a luxurious product. Fiflow® – Fiflow® has long-term effects due to its capacity to supply Oxygen to the skin. In cosmetic formulations, it acts in multiple levels (fast penetration, instant skin volume, muscular relaxation, cellular detoxification) to impart Botox®-like effect. ARGIRELINE ® NP – This ARGIRELINE peptide is well known for diminishing the appearance of expression wrinkles. Leuphasyl® – This is a revolutionary tandem when combined with ARGIRELINE ® helps in diminishing the appearance of wrinkle. These duo works great together. Cassia Angustifolia Seed Polysaccharide – Extracted from the seeds of the Indian Senna plant, botanical alternative to Hyaluronic Acid, demonstrating immediate and intense moisturizing effects that last up to 24 hours, plumping fine lines to provide a smoother, more radiant complexion. Borago Officinalis Seed Oil – It contains a high concentration of GLA (Gamma Linolenic Acid), combats inflammation and restores moisture to dry skin. 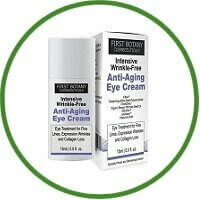 Intensive Wrinkle-Free Anti-aging Eye cream is a novel eye cream that is extremely effective at firming and plumping the skin, quickly reducing the appearance of fine lines and wrinkles and addressing the issues of puffy eyes and dark circles under eyes treatment. Buy today and notice a change in you!